For other uses, see You Can't Hurry Love (disambiguation). "You Can't Hurry Love" is a 1966 song originally recorded by The Supremes on the Motown label. (1966) "You Can't Hurry Love"
Written and produced by Motown production team Holland–Dozier–Holland, the song topped the United States Billboard pop singles chart, made the UK top 5, and made the top 10 in the Australian Singles Chart. It was released and peaked in late summer/early autumn in 1966. Sixteen years later, it would become a number-one hit in the UK when Phil Collins re-recorded the song. It reached number one on the UK Singles Chart for two weeks beginning in January 1983  and reached #10 on the US Singles Chart that same month. Billboard named the song #19 on their list of 100 Greatest Girl Group Songs of All Time. The song, a memory of a mother's words of encouragement ("My mama said 'you can't hurry love/No you just have to wait' ") telling her daughter that with patience she will find that special someone one day, is an example of the strong influence of gospel music present in much of R&B and soul music. "You Can't Hurry Love" was inspired by and partially based upon "(You Can't Hurry God) He's Right on Time" ("You can't hurry God/you just have to wait/Trust and give him time/no matter how long it takes"), a 1950s gospel song written by Dorothy Love Coates of The Original Gospel Harmonettes. 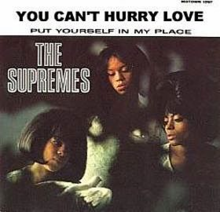 The recorded version of "You Can't Hurry Love" showcases the developing sound of The Supremes, who were progressing from their earlier teen-pop into more mature themes and musical arrangements. This song and "You Keep Me Hangin' On" were finished together; when it came time to choose which single would be issued first, Motown's Quality Control department chose "You Can't Hurry Love." Written and produced by Motown's main production team, Holland–Dozier–Holland, "You Can't Hurry Love" is one of the signature Supremes songs, and also one of Motown's signature releases. The single became The Supremes' seventh number-one hit, topping the Billboard Hot 100 singles chart for two weeks, from September 4, 1966 to September 17, 1966, and reaching number one on the soul chart for two weeks. The group performed the song on the CBS variety program The Ed Sullivan Show on Sunday, September 25, 1966. "You Can't Hurry Love" was the second single from the Supremes' album The Supremes A' Go-Go. It reached the #1 position on the Billboard Hot 100 pop chart in the United States, and #3 in the United Kingdom. The Supremes' version of the song is honored by inclusion in the Rock and Roll Hall of Fame's permanent collection of 500 Songs that Shaped Rock and Roll. The Supremes also released a version sung in Italian: "L'amore verrà" ("Love Will Come"). from the album Hello, I Must Be Going! (1982) "You Can't Hurry Love"
(1982) "I Don't Care Anymore"
The most notable cover of the song was released in late 1982 as a single by Phil Collins from his second solo album, Hello, I Must Be Going! Collins's version reached number-one on the UK Singles Chart (becoming his first number-one solo hit in the UK Singles Chart, and peaking two positions higher than the original song did in that country), and reached number 10 in the United States. The single was certified gold in the UK. The idea of doing 'Can't Hurry Love' was to see if Hugh Padgham and I could duplicate that Sixties sound. It's very difficult today because most recording facilities are so much more sophisticated than they were back then. It's therefore hard to make the drums sound as rough as they did on the original. That's what we were going after, a remake, not an interpretation, but a remake. Collins's version was the first track on the very first Now That's What I Call Music compilation CD. In the first verse, he changes "And I need to find, find / Someone to call mine" to "And I need to find time / Someone to call mine." On the second repeat of the chorus, he replaces the line "How much more can I take?" with "How much more must I take? ", and likewise exchanges the words, "...trust in the good Lord..." to "...trust in a good time...". In 1983, the music video was released on the home video Phil Collins available on Video Home System (VHS) and LaserDisc (LD) which received a Grammy nomination for Best Video, Short Form. The video itself was also the first track featured on the first VHS compilation of Now: That's What I Call Music. The song was covered by the Dixie Chicks on the soundtrack to the 1999 film Runaway Bride. Their version peaked at number 60 on the Billboard Hot Country Singles & Tracks chart. ^ "Billboard Hot 100". Billboard. Nielsen Company. 78 (38): 26. 1966. Retrieved May 10, 2011. ^ a b c Roberts, David (2006). British Hit Singles & Albums (19th ed.). London: Guinness World Records Limited. p. 417. ISBN 1-904994-10-5. ^ "Show 50 – The Soul Reformation: Phase three, soul music at the summit. [Part 6] : UNT Digital Library". Digital.library.unt.edu. 2014-03-22. Retrieved 2014-03-29. ^ Marsh, Dave. "Dorothy Love Coates / The Original Gospel Harmonettes – The Best of Dorothy Love Coates & the Original Gospel Harmonettes, Vols. 1-2 (Review)". Allmusic.com. Retrieved 26 July 2014. ^ Bronson, Fred: The Billboard Book of Number 1 Hits, page 207. Billboard Books, 2003. ^ "The Supremes, Ethel Merman, Nipsey Russell". The Ed Sullivan Show. Season 20. Episode 3. New York City. September 25, 1966. CBS. WCBS. ^ "Official Billboard Chart History of the Supremes". Retrieved 2016-01-05. ^ "Diana Ross and the Supremes Biography". Rolling Stone. Retrieved 2016-05-08. ^ "Item Display – RPM – Library and Archives Canada". Collectionscanada.gc.ca. Retrieved 2014-03-29. ^ "Item Display – Official Charts Company". officialcharts.com. Retrieved 2015-06-26. ^ "Go-Sets National Top 40". 1966-10-26. Retrieved 2015-06-26. ^ "Top 100 Hits of 1966/Top 100 Songs of 1966". Musicoutfitters.com. Retrieved 2016-09-30. ^ "Top 100 1966 – UK Music Charts". Uk-charts.top-source.info. Retrieved 2016-09-30. 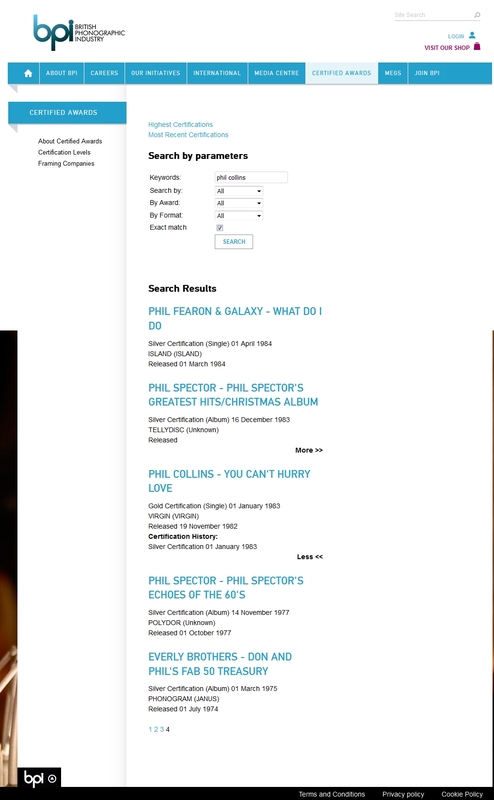 ^ a b "BPI > Certified Awards > Search results for Phil Collins (page 4)". British Phonographic Industry. Retrieved 2016-02-16. ^ Dean, Maury (2003). Rock N' Roll Gold Rush. Algora. p. 60. ISBN 0-87586-207-1. ^ "Phil Collins - Phil Collins at Discogs". Discogs. Retrieved March 18, 2018. ^ "Phil Collins - Phil Collins (VHS) at Discogs". Discogs. Retrieved March 18, 2018. ^ "Phil Collins - Phil Collins (LaserDisc) at Discogs". Discogs. Archived from the original on 2018-03-19. Retrieved March 18, 2018. ^ Kent, David (1993). Australian Chart Book 1970–1992 (Illustrated ed.). St. Ives, N.S.W. : Australian Chart Book. p. 71. ISBN 0-646-11917-6. ^ "austriancharts.at > Phil Collins – You Can't Hurry Love" (in German). Hung Medien. Retrieved 2016-02-16. ^ "Ultratop > Phil Collins – You Can't Hurry Love" (in Dutch). Hung Medien. Retrieved 2016-02-16. ^ "Top RPM Singles: Issue 6178." RPM. Library and Archives Canada. Retrieved 2016-05-08. ^ "dutchcharts.nl > Phil Collins – You Can't Hurry Love" (in Dutch). Hung Medien. Retrieved 2016-02-16. ^ "Top-Hebdo" (in French). SNEP. 1983-03-05. Retrieved 2016-05-08. ^ "Offizielle Deutsche Charts > Phil Collins – You Can't Hurry Love (single)" (in German). GfK Entertainment. Retrieved 2016-02-16. ^ "The Irish Charts – All there is to know > Search results for 'You Can't Hurry Love'". Fireball Media. Retrieved 2016-02-16. ^ "Hit Parade Italia – Indice per Interprete: C". Hit Parade Italia. Retrieved July 6, 2012. ^ "charts.org.nz > Phil Collins – You Can't Hurry Love (song)". Hung Medien. Retrieved 2016-02-16. ^ "SA Charts 1965–March 1989". Retrieved 2 September 2018. ^ "swedishcharts.com > Phil Collins – You Can't Hurry Love (song)". Hung Medien. Retrieved 2016-02-16. ^ "hitparade.ch > Phil Collins – You Can't Hurry Love" (in German). Hung Medien. Retrieved 2016-02-16. ^ "Billboard > Artists / Phil Collins > Chart History > The Hot 100". Billboard. Retrieved 2016-02-16. ^ Whitburn, Joel (2002). Top Adult Contemporary: 1961–2001. Record Research. p. 61. ^ "Item Display – RPM – Library and Archives Canada". Collectionscanada.gc.ca. Archived from the original on August 11, 2016. Retrieved September 30, 2016. ^ "Top 100 1983 – UK Music Charts". Uk-charts.top-source.info. Retrieved 2016-09-30. ^ "Top 100 Hits of 1983/Top 100 Songs of 1983". Musicoutfitters.com. Retrieved 2016-09-30. ^ Whitburn, Joel (2013). 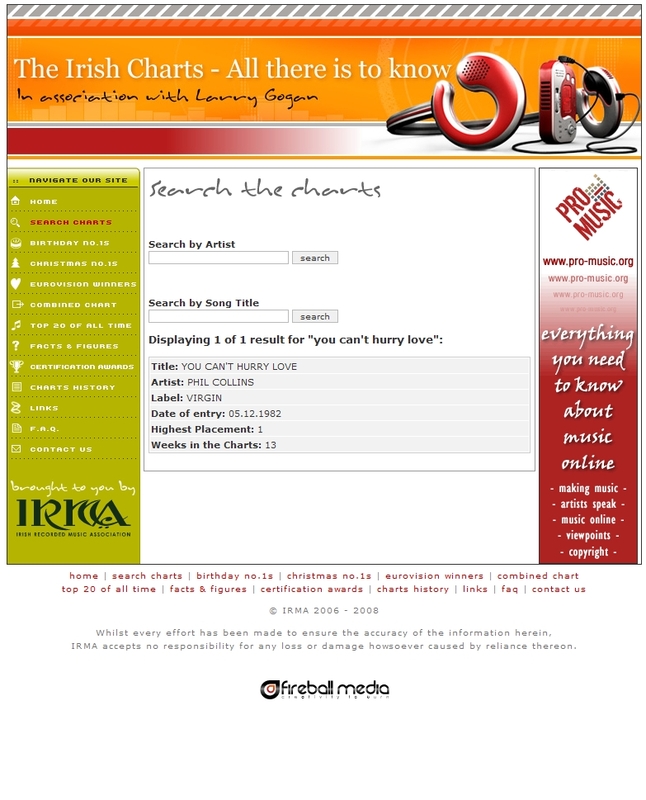 Hot Country Songs 1944–2012. Record Research, Inc. p. 102. ISBN 978-0-89820-203-8.